Everyone has opinions and ideas. In this section I list articles that I have written on the board gaming hobby. 2015/01/11 - Kevin Sims provides some updated links and lovely pictures of his Middle Earth themed Settlers tiles. 2010/01/16 - Added more reader contributions and wonderful photos of Jón Stefánsson's and Peter Schmidt's 3D Settlers Tiles. 2008/05/18 - Added some updates and beautiful photos of Kevin Sims's 3D Settlers Tiles. 2006/08/06 - Added some updates and beautiful photos of Tim Stoner's 3D Settlers Tiles. 2005/05/29 - Created episode 5 of Hagbard and Hrothgar that fun Goth dark ages comic. 2005/05/22 - Created some camps and baggage handlers for the DBA miniatures war game. 2005/05/22 - Added some updates and beautiful photos of Gerard Boom's 3D Settlers Tiles. 2005/04/10 - Updated one of the early dice tower articles with a submission from JR Hendricks of Texas Tech at Lubbock Texas. 2005/03/31 - Created a 15 mm DBA army for the Early Imperial Romans (II/56). 2005/03/30 - Created episode 4 of Hagbard and Hrothgar, with some fun-loving monking around. 2005/01/23 - Created a Ancient British (II/53) army for the DBA miniatures war game. If you are using this page to read about miniatures and terrain, you should read the Miniatures Page as soon I will stop adding this news to the games pages. 2004/11/22 - Learn how to make the Town Pub building for miniatures gaming. 2004/11/21 - Added a small article on my German Raider warband. 2004/11/01 - Took a few snapshots of my Anglo Saxon Raiders. 2004/10/24 - Created a Teutonic Order (IV/30) army for the DBA miniatures war game. 2004/10/21 - Wrote a battle report for the "Pillage the Village" Pig Wars Game played on 2004/10/17. 2004/10/01 - Added rules for a Pig Wars Pillage the Village scenario. Enjoy this multi-player attack on the Dark Ages town inhabitants. 2004/09/12 - Another Gothic episode of Hagbard and Hrothgar at the Hagbard and Hrothgar page. 2004/08/22 - Posted rules for Tiki Wars a multiplayer battle game for DBA. 2004/08/22 - Six Stages of Drinking as told by the Vikings. 2004/07/18 - Created a page with some Barker Markers for the DBA miniatures war game. 2004/06/14 - Created a French Infantry Company army for the Flames of War miniatures WWII war game. 2004/05/31 - Created a Polynesian (IV/12) army for the DBA miniatures war game. 2004/03/31 - Created a Rus (III/48) army for the DBA miniatures war game. 2004/02/18 - Created another episode of Hagbard and Hrothgar that fun Goth dark ages comic. 2004/02/15 - Created an Early Franks (II/72) army for the DBA miniatures war game. 2004/01/24 - Created a comic strip Hagbard and Hrothgar based on some 28 mm miniatures I've painted. 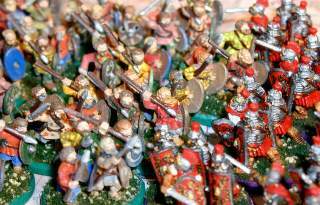 2003/12/22 - Created a Romano-British (II/81) army for the DBA miniatures war game. 2003/12/08 - Created a Saxon Church model for miniatures gaming using Hirst Arts architectural blocks. 2003/10/03 - Created Five Bridges of different styles for miniatures gaming using Hirst Arts architectural blocks. 2003/09/11 - Created a Celtic Round Tower for miniatures gaming using Hirst Arts architectural blocks. 2003/09/02 - The Italian Campanile Dice Tower has won first place in the Hirst Arts Design Derby 4, Unique Category at the VoidGamers.com site. 2003/06/08 - Created an Italian Campanile Dice Tower using Hirst Arts architectural blocks. 2003/03/09 - Created an article on the construction of a stone dice tower using Hirst Arts architectural blocks. 2002/12/14 - Read about the ancient battles of the Picts and Brigantes. Also see the 15 mm figures I've painted. 2002/07/20 - See the Mark I and Mark II Hobby Paint Mixers created for mixing small bottles of acrylic paints. 2002/07/16 - Read about modelling Britannia in Scale ensuring that the figures and the board are properly sized. 2002/07/07 - Read about the ancient battles of the Romans and the Welsh. Well, truthfully, it's about some 15 mm figures I painted. 2002/04/20 - See how to make a plastic resin casting of a Roman Mile Fort for use with miniatures and board gaming. 2002/01/26 - Here's an article on assembling and building Flying Tricycle LLC's laser-cut wooden dice tower. The Lost Tiles of Carcassonne - a slightly warped set of proposed Carcassonne tiles. 2001/09/08 - Quick, look away. Evil. Do not read the article Transmogrifying Sauron. You will be at Sauron's beck and call and forced to improve your Sauron figure in Reiner Knizia's Lord of the Rings board game. Two new articles on Battle Cry figure painting from figure artists Scott Brooks and Brady Severns join my original Battle Cry Painting article. The Gaming Challenge 2001 - See how several wacky gamers are attempting to play 365 games in 365 days. Games Day 2000 - This is an irreverent look at the games played and the events of this monumentous day. Games Played 2000 - an overview of the hits and misses in over 950 games played in the year 2000. Casting a Three Dimensional Settlers of Catan game board. - This article in four parts details the making of a fancy Settlers game. How to paint Battle Cry figures - useful painting tips and hints for Hasbro's fun board strategy game. The Dice Tower - describes a useful handcraft to help randomize and roll many dice. Fun! 24 Hours of Gaming - describes a marathon 24 session of gaming on Games Day in 1998. Stay tuned for more articles. Last modified: Saturday, 05-Sep-2015 09:47:03 MST.